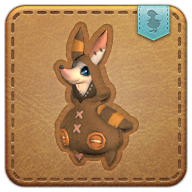 Summon your wind-up Qiqirn minion. As adorable as the real thing, without the ratty odor. Once upon a time, there was not a man, woman, or child in all of Limsa Lominsa who did not know the name Zazaroon, mummer extraordinaire. However, a taste for spiced rum, a failed marriage, and several run-ins with the Barracudas saw the Qiqirn fall from the limelight into oblivion.